Earlier this year, we found out that on average woman spends 55 minutes in the morning getting ready. But did you know that in the time it takes you to get ready in the morning, you’ve already ingested up to 168 chemicals? 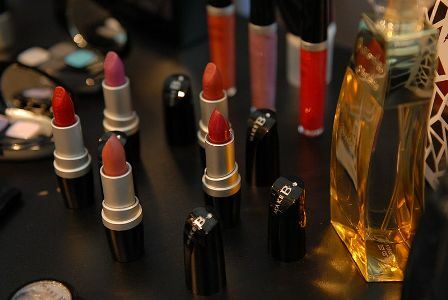 And by purchasing some of the beauty brands on the market, you could be encouraging unethical practices, like animal testing and forced labour, and contributing to the destruction of the environment – all in a tube of lipstick or a palette of eyeshadow! Having said that, don’t pick up the closest product labelled “natural” or “organic” just yet. Lack of industry regulation, loopholes in existing legislation, market forces and consumer ignorance are all factors that allow beauty companies to use whatever means possible to keep their costs down and their profits up. Until stricter regulation is put in place, the best thing to do is to be informed and choose wisely. Next time you’re shopping for beauty products, consider the health, environmental and ethical impacts of your products. This week we look at the toxins that could be lurking in your beauty products. While beauty companies are known to boast the latest technologies or ingredients, the reality is products are stuffed with cheap fillers that help extend shelf life. Here is a shortlist of some of the toxins to look out for. If there’s any beauty toxin you’ve heard of, it’s probably this one as it’s in just about everything. It’s a synthetic preservative used to make products last longer. They mimic the hormone oestrogen and have been linked to breast cancer, male and female fertility issues, early puberty and immune system dysfunctions. From beauty products to car washes and industrial strength floor cleaners, sulfates are used because they’re cheap and can clean oil easily. Essentially, they make things foam, but they’re also eye and skin irritants as well as endocrine disruptors. Male sterility, liver and kidney damage, birth defects, asthma, early puberty, cancer, polycystic ovarian syndrome and endometriosis are just some of the medical implications phthalates have been linked to. Phthalates are most commonly used in perfumes and nail polish as well as pesticides, toys and plastics. These are used as emulsifiers and they also help balance the pH levels of products. However, they’re skin and eye irritants, linked to medical conditions from conjunctivitis and eczema to kidney damage. Used in deodorant to kill bacteria and block the sweat glands, you’ve probably also heard of this chemical too as there has been a lot of dispute over its level of toxicity – some research suggests a link between aluminium and breast cancer as it can mimic the hormone oestrogen, which can further the growth of breast cancer cells. This is mainly used in products as a preservative. In excessive amounts, it can cause problems for your skin, immune system and liver. Most worryingly is that it’s often unlisted because it is released by some ingredients (such as imidazolidinyl urea) as a contaminant. The lack of regulation means that toxins linked to cancer, allergies and hormonal imbalances can still be used with the promise of the perfect skin. Though the scary thing is many ingredients have had such little testing that their long-term effects are largely unknown. If you need a science degree to decipher the ingredient list, then it’s probably best to keep the product away from your beauty collection. This entry was posted in Featured, Health and tagged beauty, ethical beauty, health. Bookmark the permalink.